Alisha Spielmann and August Schulenberg in World Builders: a love story. Photo by Isaiah Tanenbaum. BOTTOM LINE: Faced with the loss of their complex fantasy lives, two misfits find love and purpose in each other. 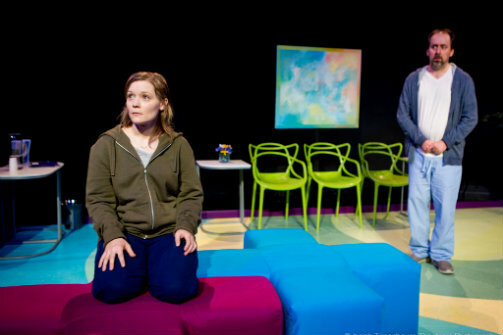 World Builders’ rich interior unfolds before a single line is spoken, as its fifteen-minute pre-show bears witness to characters Whitney (Alisha Spielmann) and Max (August Schulenberg)’s silent interactions with their respective inner worlds. These complex pantomimes, and the actors’ wholehearted commitment to the fictions they suggest, form a play unto themselves, our imaginations rushing to fill the details of the lively engagement, awestruck fixation, and frantic terror we observe. The effect is instantly fascinating, and sets World Builders’ tone as Whitney and Max’s private lives ripple outward into a shared tale of love, agency, and devotion. Temporarily hospitalized for schizoid personality disorders and chronic lapses into fantasy, Whitney and Max have agreed to take part in a new drug study—one which promises to cure them of their delusions and dissolve the worlds into which they retreat. Enamored with the elaborate, bizarre sci-fi realm of her imagination, Whitney is reluctant to part with her world and abandon the creatures that people it. Max, by contrast, longs to escape his world, a terrifyingly singular serial killer’s lair, but bears a crippling responsibility for the women locked inside. With memories of their worlds progressively dwindling, Whitney and Max agree to preserve each other’s creations by exchanging stories and recording the details they receive. As the act of sharing and the drugs’ effects replace dissociative fantasy with vivid emotion, the two stumble into mutual respect and sweetly awkward love. When the end of the study, and the continued obligation to medicate, puts both worlds and the relationship in further peril, Max and Whitney must decide whether to cling to the happiness they have built or abandon it in hopes of a “normal” life. Humorous, heartfelt, and philosophical of its own accord, Johnna Adams’ script shines under the actors’ chemistry and realism. Spielmann’s Whitney is as multifaceted as the universes she invents, balancing charming self-absorption with deeper feelings of shame and inadequacy, and zeal for her world with fear of the hollowness beneath it. As his cagey agitation morphs into trust, Schulenberg reveals in Max an unexpected tenderness and selfless commitment to those he loves. The pair’s interactions are just as layered: suspicious of emotions and unaccustomed to interpersonal dynamics, Whitney and Max use their worlds as a shared language through which they attack, comfort, process, and bond with each other. Similarly marginalized and conscious of the value of world-building, we can see how these misunderstood individuals would find in each other kindred spirits and fitting keepers of their narratives. As its characters face the changes before them, World Builders raises some finer questions about perception and creative responsibility. As authors of their worlds, Max and Whitney share a quasi-parental sense of duty toward their creations and a profound concern for their fate once the drugs take hold. In this context, the stewardship of each others’ worlds acquires staggering relevance, the act of bearing witness a deeper form of service and love. Additionally, the play calls us to reconsider the realities to which we subscribe and their role in shaping our self-conception. With Max and Whitney’s worlds forming the core of their identities, the loss thereof implies a chilling loss of self, and the two struggle to fill the void their absence will leave. While their nascent bond seems genuine, both characters wrestle with the possibility that it only serves to replace the fantasies they leave behind. World Builders: a love story is Written by Johnna Adams and Directed by Kelly O’Donnell. Presented by Flux Theatre Ensemble. Scenic Design by Will Lowry. Lighting Design by Kia Rogers. Costume Design by Stephanie Levin. Sound Design by Kelly O’Donnell. Prop Design by Lori E. Parquet. Production Stage Manager is Ben Shipley. The cast is Alisha Spielmann and August Schulenberg.